MCLEAN, VA--(Marketwired - Jul 13, 2017) - Freddie Mac (OTCQB: FMCC) today released the results of its Primary Mortgage Market Survey® (PMMS®), showing average mortgage rates rising across the board for the second consecutive week. 30-year fixed-rate mortgage (FRM) averaged 4.03 percent with an average 0.5 point for the week ending July 13, 2017, up from last week when it averaged 3.96 percent. A year ago at this time, the 30-year FRM averaged 3.42 percent. 15-year FRM this week averaged 3.29 percent with an average 0.5 point, up from last week when it averaged 3.22 percent. A year ago at this time, the 15-year FRM averaged 2.72 percent. 5-year Treasury-indexed hybrid adjustable-rate mortgage (ARM) averaged 3.28 percent this week with an average 0.5 point, up from last week when it averaged 3.21 percent. A year ago at this time, the 5-year ARM averaged 2.76 percent. "After fully absorbing the sharp increases in Treasury yields over the past couple of weeks, the 30-year mortgage rate has cleared the psychologically important 4 percent mark for the first time since May. 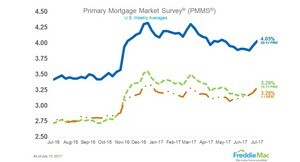 Today's survey rate stands at 4.03 percent, up 7 basis points from last week."